, an eminent dissenting divine, and the historian of the Puritans, was born in London, Dec. 14, 1678, and educated at Merchant-Taylors’ school, of which he was head scholar in 1697. He appears to have then declined proceeding to St. John’s, Oxford, and determined to enter as a student in a dissenting academy, under the direction of the rev. Thomas Rowe. Three years after he removed, for the farther prosecution of his studies, to Holland, where he heard the lectures of Graevius and Burman, during two years, and afterwards passed a year at Leyden. Soon after his return to London, in 1703, he began to officiate as a preacher, and in 1706 succeeded Dr. Singleton as minister to a congregation at Loriners’ Hall. Of this congregation, which, for want of room, rmoved afterwards to a more commodious meeting in Jewinstreet, he remained pastor for thirty-six years, and was esteemed one of the most useful, laborious, and learned divines of his communion. Although assiduous and indefatigable in the discharge of the duties attached to the ministerial office, he found leisure for writing those works which gained him much fame among the dissenters during his lifetime, and have rendered his a name of importance in our own days. His first production, which appeared in 1720, was his “History of New England; being an impartial account of the civil and ecclesiastical affairs of the country, with a new map, &c.” 2 vols. 8vo. 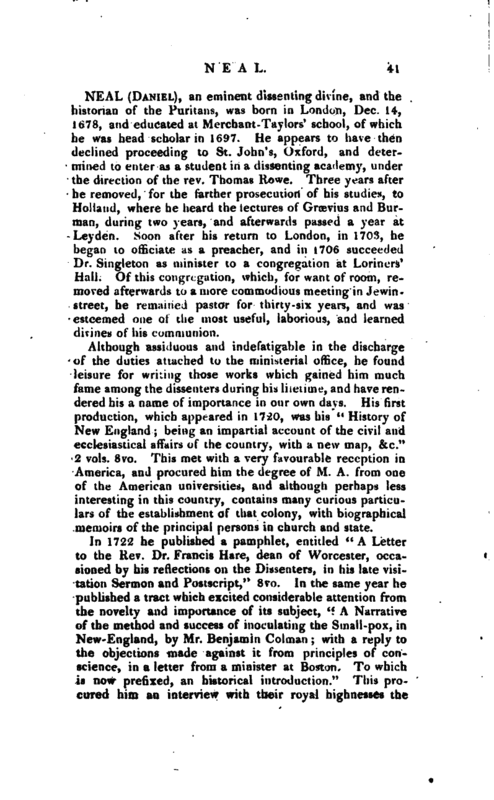 This met with a very favourable reception in America, and procured him the degree of M. A. from one of the American universities, and although perhaps less interesting in this country, contains many curious particulars of the establishment of that colony, with biographical memoirs of the principal persons in church and state. In 1722 he published a pamphlet, entitled “A Letter to the Rev. Dr. Francis Hare, dean of Worcester, occasioned by his reflections on the Dissenters, in his late visitation Sermon and Postscript,” 8vo. In the same year he published a tract which excited considerable attention from the novelty and importance of its subject, “A Narrative of the method and success of inoculating the Small-pox, in New-England, by Mr. Benjamin Colman; with a reply to the objections made against it from principles of conscience, in a letter from a minister at Boston. To which is now prefixed, an historical introduction.” This procured him an interview with their royal highnesses the | prince and princess of Wales, afterwards George II. and queen Caroline. From this time he published only five occasional sermons, till 1732, when the first volume of his “History of the Puritans” appeared; and continued to be published, the second volume in 1733, the third in 1736, and the fourth in 1738, in 8vo. Of the impartiality of this work various opinions were then and are still entertained. We have had repeated occasions to examine it, and we think it exhibits as much impartiality as could have been expected from a writer whose object was to elevate the character of the puritans and non-conformists, at the expence of the members of the established church. And when it was discovered that he represented the church of England as almost uniformly a persecuting church, it was not surprizing he should meet with answers from those who, in surveying the history of the puritans, when they became known by the name of non-conformists, considered that the ejected were at one time the ejectors; the right of the usurping powers in Cromwell’s time to throw down the whole edifice of the church, being the main principle on which the controversy hinges. 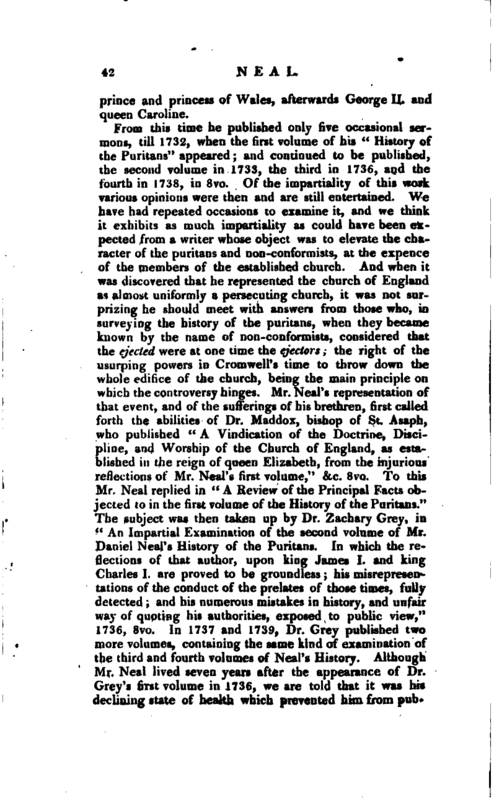 Mr. Neal’s representation of that event, and of the sufferings of his brethren, first called forth the abilities of Dr. Maddox, bishop of St. Asaph, who published “A Vindication of the Doctrine, Discipline, and Worship of the Church of England, as established in the reign of queen Elizabeth, from the injurious reflections of Mr. Neal’s first volume,” &c. 8vo. To this Mr. Neal replied in “A Review of the Principal Facts objected to in the first volume of the History of the Puritans.” The subject was then taken up by Dr. Zachary Grey, in “An Impartial Examination of the second volume of Mr. Daniel Neal’s History of the Puritans. In which the reflections of that author, upon king James I. and king Charles I. are proved to be groundless; his misrepresentations of the conduct of the prelates of those times, fully detected; and his numerous mistakes in history, and unfair way of quoting his authorities, exposed to public view,” 1736, 8vo. 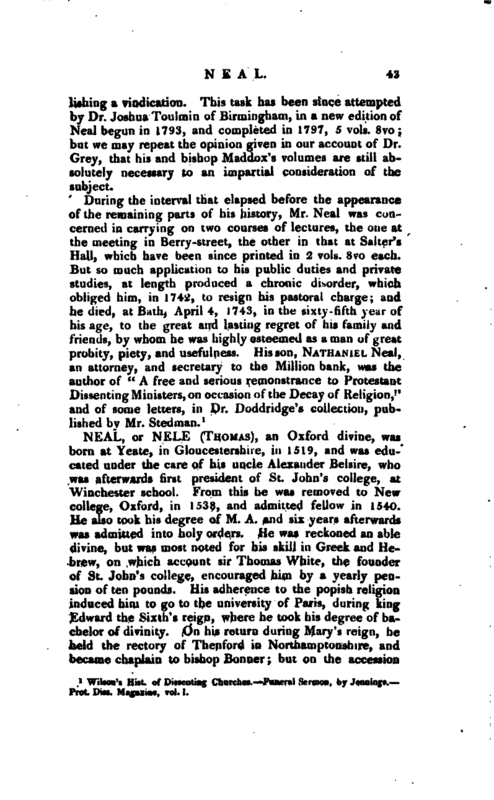 In 1737 and 1739, Dr. Grey published two more volumes, containing the same kind of examination of the third and fourth volumes of Neal’s History. Although Mr. Neal lived seven years after the appearance of Dr. Grey’s first volume in 1736, we are told that it was his declining state of health which prevented him from | publishing a vindication. This task has been since attempted by Dr. Joshua Toulmin of Birmingham, in a new edition of Neal begun in 1793, and completed in 1797, 5 vols. 8vo; but we may repeat the opinion given in our account of Dr. Grey, that his and bishop Maddux’s volumes are still absolutely necessary to an impartial consideration of the subject. Wilson’s Hist. of Dissenting Churches.—Funeral Sermon, by Jennings.— Prot. Diss. Magazine, vol. I.